Dr. L.P. Misra has concluded his rejoinder arguments. Arguments of learned counsel for the petitioners have now been concluded. Sri Prashant Chandra, learned Senior Advocate, appearing on behalf of the State-respondents prays for and is granted two days' time to seek specific instructions from the State Government in respect of arguments advanced by learned counsel for the petitioners. However, Sri Prashant Chandra, learned Senior Advocate, has submitted that he has already argued the points, which have been raised in the writ petitions, but since some new arguments have been developed during the course of rejoinder arguments, therefore, those arguments need to be addressed to the Court and therefore, some time is required. 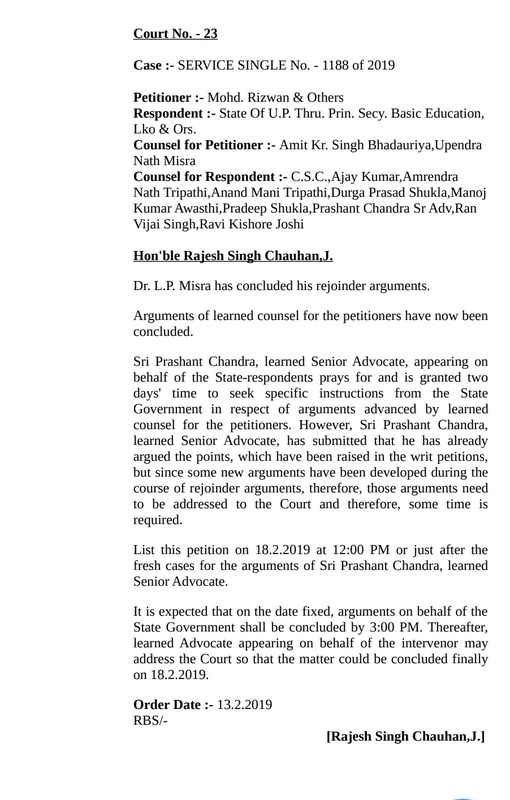 List this petition on 18.2.2019 at 12:00 PM or just after the fresh cases for the arguments of Sri Prashant Chandra, learned Senior Advocate. It is expected that on the date fixed, arguments on behalf of the State Government shall be concluded by 3:00 PM. Thereafter, learned Advocate appearing on behalf of the intervenor may address the Court so that the matter could be concluded finally on 18.2.2019.